"How do I get my work into corporate collections?" is the question a reader sent me recently. I can answer this from my personal experience, but I'm going to depend on all of you to add your own information to this post via the comments. Small companies and corporations will be approachable. Maybe you’re a customer or client of one of them. A physicians' group is corporation, for instance. So is a law or accounting office. So is an apartment co-op. You can probably ask the receptionist, or the person you deal with, for the name of the person to talk to, which might be the managing partner or office manager. If the walls are bare (or worse, postered) there's probably no one making art decisions, so you could end up being the go-to person simply because you were the person who went to them. There's also the personal referral. Here's a for instance: The director of libraries for a large institution had just overseen every aspect of a new building, including the acquisition of art. She is someone who has followed my career and personally collected my work. When the time came to acquire work for the board room, she knew exactly which of my pieces she wanted to place in that space. Here's another: The managing partner of a New York City law firm had just overseen the renovation of an additional floor of offices. When the time came to acquire art, he turned to his dealer, from whom he has acquired work for his personal collection. (Notice a pattern here? It has to do with comfort and trust.) Together, the managing partner and the dealer put together a collection that projected the corporation's image—bold and dynamic but not too edgy. In larger corporations, a staff curator makes those decisions. In other instances a freelance curator—who might work for the corporation or for the architect in charge of construction or renovation—may be called in to do a specific job. Alternatively an interior designer or design consultant hired by the corporation or the architect might be called. A big corporate acquirer of art is the hospitality industry--i.e. hotels and restaurants. Airlines are not buying art for their planes, but they do buy for the corporate offices and the first-class lounges. Maybe I'm oversimplifying, but who handles the job depends on whether the venue is looking for art to create a collection or to go with the decor (no value judgment here; art serves many purposes). Sometimes, there's an overlap. The big corporations may require that the curator/architect/designer/ consultant make a presentation. Smaller works might be physically brought in. Catalogs, exhibition announcements, and supporting material may factor into the decision. Once the decisions are made, the curator/architect/designer/ decorator will return to specific galleries or artists to pick up the work and install it, or have it installed. Show regularly. If you’re not with a gallery, show at alternative spaces, academic galleries, and open studios. The more your work is out there, the more likely it is to be seen.
. Hit the Internet. Who are art consultants, architects and decorators in your area? Put them on your postcard mailing list, and if they have an e-address, send them an invitation to visit your website. Let them know you'd welcome them for a studio visit.
. You do have a website, right? One big developer who selected the art for his buildings told one of my dealers that he had "depleted" his immediate area and had hit the Internet in search of more choices, which was why he'd ended up in her city and specifically at her gallery, and more specifically with my paintings.
. Do your own research. What are the small corporations in your region? If you do work that references biology, see if there are biotech startups in your area. Working digitally? Where are the tech firms in your area?. Libraries often respond to book themes. Find out who the chiefs and managers are and put them on your postcard list. They may be intrigued. How many other people are sending them art postcards?
. Who are the freelance curators and consultants? Tap into the artists' network; ask around. Who has been approached by a curator/architect/designer/consultant? Ask if there's a particular person who works well with artists, respects the work, pays promptly.
. Is there a percentage-for-art program in your city or state? Check it out. One percent of a multi-million-dollar project can yield a tidy sum for art.
. Some work may be commissioned, but that's a whole other post. The curator/architect/designer/consultant is working for the client, not for you. That doesn't necessarily mean you'll be treated badly, but understand the priority. Best-case scenario: You and your work are treated with the respect you deserve. Worst-case scenario: You're considered a supplier, like the carpet company, or a service provider, like the trash pickup. If you work through a dealer, you'll be shielded from much of this unpleasantness.
. Consultants typically receive a commission on sales, as opposed to a curator who is hired for the job. A consultant may thus be motivated to take in a lot of work to present in the hopes of the corporate decisionmakers liking at least some of it. So don’t get your hopes up.
. If work is going to leave your studio on spec, make sure the person taking it is insured. Make sure there's a written agreement to spell out who’s responsible for damage. If it's going out from your gallery, the dealer handles this.
. The person finding the work is not usually the person who will pay you for it, so you may wait a long time for payment if your work gets selected. Partly this is because corporations are used to the 30-, 60-, or 90-day invoicing. Ninety days is three months after a process that has likely taken six months. So you could wait close to a year for payment. (Someone at the six- or eight-figure corporate level has no idea that the check for an artwork could be used to make a mortgage payment, pay a dental bill, or put food on the table.) If you have several such sales in the pipeline, the waiting is not so bad, because checks arrive regularly. The curator/architect/designer/consultant whose selection is applauded is likely to get more such jobs. If your work has gotten a good response in their jobs, they’re likely to come back to you. Do you have a different take on the process from what I've described? Feel free to agree or disagree, or to add something to the process. Do you have anedcotes? Dealers, curators, decorators, please add your voices to the discussion. When my artist husband was very ill and had a lot of hospital bills we couldn't even begin to pay, I contacted the director of the hospital who forwarded my message to someone in charge of public relations at the hospital. I told them point blank that whatever my health insurance couldn't cover, I couldn't either, and I offered them a trade. They could come to my husband's studio and select one or more works to hang on the hospital's walls. In return, the hospital expenses (thousands of dollars) I would be responsible for would be waived. The hospital agreed with the trade (at least they'd get something like that), a representative selected two large framed works on paper, and they have been hanging for nearly a decade or so in the physical rehab center waiting room, prominently displayed with a little plaque showing the artist's name. Several people, one as recently as a week ago, tell me when they learn about my connection with the artist "Oh, I see his work hanging in the hospital every time I go there to exercise in the pool." As you mention, the selected artworks had to be "uplifting." And they were. And everyone wins, including the patients who won't need to sit and wait and look at a boring bare wall anymore. This posting is very complete and true to my experiences in this area. I'd add, and it's somewhat of a bridge to the last MM post on commissions and a springboard to an upcoming post...when a corporate client is commissioning me to create a piece, I have, at times, added an additional 10% fee. Some of the reasons this fee is charged: there is a tight timeline involved or special ordering of panels is required. Essentially, if the parameters of the commission demand that I derail my focus on my studio work to achieve (rather than allowing me to fold it into) it the fee will be added. Debra says: "Essentially, if the parameters of the commission demand that I derail my focus on my studio work to achieve (rather than allowing me to fold it into) it the fee will be added." Nemastoma and Mead: Nice outside-the-paintbox thinking. Interesting Article – this just shows why stuff is just crazy in the world these days – just like an Iphone App that helps people pick up women! www.TheVirtualWingman.com. 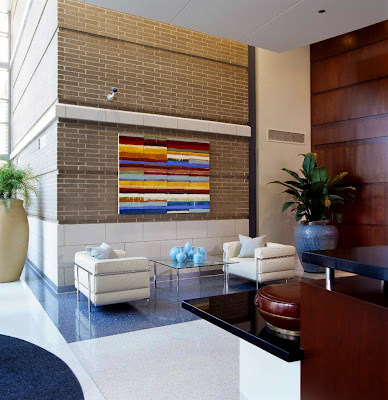 I had been very fortunate to get many pieces placed in corporate collections through art consultants and directly to one large financial company. However, that market has dried up like Death Valley for the past year. I'm hoping it revives sometime soon in 2010. I was always paid promptly and it was no hassle money. My experience with art consultants follows the earlier Marketing Mondays recommendations on making gallery connections. I sent out a number of painstakingly compiled packets and heard nothing back, even with a SASE enclosed. But the two consultants I've worked with for the past few years, who have sold numerous pieces of my work, FOUND ME, one through the recommendation of another artist she'd been working with, and the other through a random search online that brought up my website.